Rules: One male and one female member can work at a time. Each team will get a men’s lane and a women’s lane. Each team member must complete the 15-12-9 rep scheme. Score will be determined by adding the total time from each lane. The second team member in each lane may not begin the workout until the first team member in that lane has completed the entire 15-12-9. 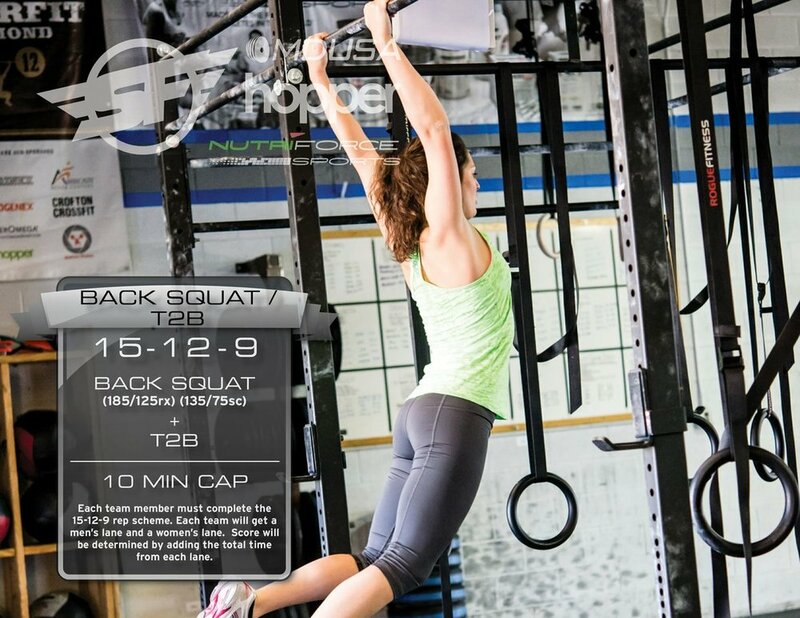 The back squats must be pulled from the floor, no racks will be provided. Teams will also have the option of assisting other teammates to get the bar on to their back. Each lane will get a one second penalty for each rep not completed within the time cap. Backsquat: Must be pulled from the floor. No racks will be provided. Team members must may help rack the bar on their teammate’s back. With the barbell resting on the back, the barbell must pass through a full squat (hip crease below the knee). Hips and knees must be fully extended at the top of the movement. T2B: The feet must break the plane of the bar with both feet MAKING CONTACT with the bar inside the athlete’s hands. The bar may be touched with the toes, top, or bottom of the feet. Scoring: Combination of the men's and women's lane completion time.